"This tattoo by Luis Martins at Lovecraft (Hamden, CT) is inspired by a Pennsylvania Dutch hex motif. Distelfinks ("thistle-finches") and the tulips are talismans for luck, but it’s also in tribute to my paternal grandparents, who had deep Penn-Dutch roots. I go back and forth on if the birds directly represent them or if it’s a more nebulous image. Luis took the original image and had an idea to translate it into a Norwegian rosemaling style, which turned out nicely. Different people have seen aspects of their own heritage’s folk art in the piece, and I think the clean lines and the limited palette contribute to that perception. I find it hard to write with formal restraints while still connecting the reader to larger ideas, so I have tremendous respect for Luis’ process and craft doing it in ink." and swerve onto the freeway. for good people over the depths ahead. 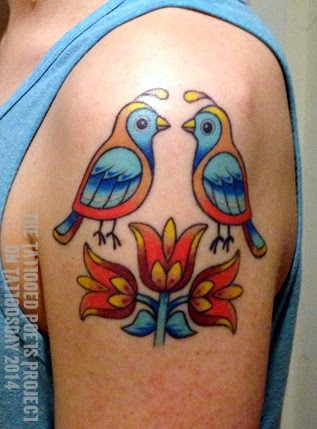 Thanks to Mike for sharing his tattoo and poem with us here on Tattoosday's Tattooed Poets Project!